IBPS Calendar for IBPS PO, SO, Clerk, Officer, Officer Assistant Exam Dates 2019-2020: IBPS Calendar 2019 - Tentative exam dates for IBPS PO, SO, Clerk, Officer, Officer Assistant Exams 2019 released on ibps.in. 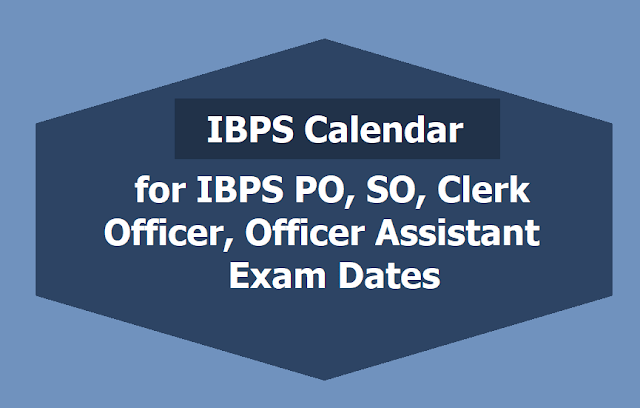 IBPS has release the calendar for the upcoming IBPS SO, PO, Clerk, Officer, Officer Assistant Recruitment Exams 2019. Institute of Banking Personnel Selection, IBPS has published the tentative calendar for year 2019-2020 that incorporates exam dates and other important dates of IBPS PO 2019, IBPS Clerk 2020, IBPS SO 2020 and the IBPS RRB Officer, Officer Assistant 2019 recruitment exams. The preliminary and main examination dates for all the above mentioned exams are included in the tentative calendar. The complete details of IBPS Calendar 2019 is given below. Institute of Banking Personnel Selection, IBPS, the recruitment body conducts IBPS PO, IBPS SO, IBPS Clerk and IBPS RRB recruitment exams every year to recruit staffs and officers in different public and private sectors. The selection body like every year released IBPS Banking Exam 2019 Calendar this year as well. the exam calendar encompasses the exam dates of IBPS PO, Clerk and RRB exam dates in it. Candidates who are willing to take up banking jobs can check the complete table of exam dates given below to know better about the exam dates and exam conducted. The registration process conducted for IBPS exams are through online mode and single registration is done for both Preliminary and Main examination. Candidates are required to upload the mentioned documents like photograph of the applicant, signature of the applicant, thumb impression of the applicant, scanned copy of handwritten declaration during the time of the application process. The official notification for all the examination mentioned above will released three months prior to preliminary exam dates conducted by the selection board. So, technically the IBPS RRB 2019 notification is expected to release in the month of May 2019. The notification will be available on the official site of IBPS at ibps.in. Along with the tentative date for the examinations, tentative dates for notification release are also being shared below. These dates are based on trends and patterns followed by IBPS in regards the time between a notification and the examinations. Exact date for release of notification, however, may vary. IBPS conducts recruitment examinations for banking jobs across various Public Sector Banks like Punjab National Bank, Allahabad Bank, Canara Bank, etc as well as for Regional Rural Banks or RRBs. The recruitment t Clerical level, Probationary Officer or Management Trainee level and Specialist Officer level are conducted each year. Vacancies are released at the time of the notification. a) The registration process will be through online mode only and there will be a single registration for both Preliminary and Main examination, wherever applicable. b) Candidates will be required to upload the following documents as per the specification given in advertisement. For Detailed Notifications. Prospective candidates are also advised to visit official website of IBPS www.ibps.in regularly for detailed notification for each of the above examinations to be displayed in due course.